Be sure to check out JP's new calligraphy website, jpantercalligraphy.com. She specializes in Copperplate, flourished Copperplate and Weaver writing styles of calligraphy. J.P.'s companion website Thistle Creek Studio is where you'll find all her nature and landscape inspired watercolors. This year one of her paintings of El Capitan in beautiful Yosemite Valley was juried into the annual Yosemite Renaissance XXVI Exhibition. This is quite an honor! The exhibition runs from Friday February 25th to May 2nd 2011. After that, the artwork goes on tour until November 2011. The exhibit is at the Yosemite Museum Gallery, next to the Yosemite Valley Visitor Center and near the Ansel Adams Gallery in Yosemite Valley (directions). Yosemite Renaissance is an annual competition/exhibition which is intended to encourage diverse artistic interpretations of Yosemite. 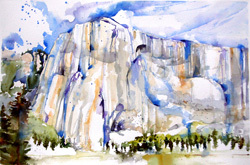 Its goals are to bring together the works of serious contemporary artists that do not simply duplicate traditional representations; to establish a continuum with past generations of Yosemite artists; and to help re-establish visual art as a major interpretive medium of the landscape and a stimulus to the protection of the environment. Historically, the arts have played a very important role in the establishment of our State and National Parks. It is our hope that they can be just as important in future efforts to preserve and protect that heritage. 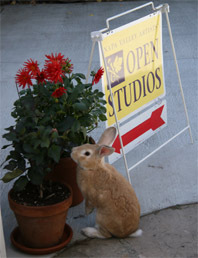 Mark your calendars, the last two weekends of every September is the annual Napa Valley Open Studios tour. J.P. shows off her newest watercolors, and calligraphy too.